After one of our fellow foodies ate here a while ago and things went well for them - one raved about the passionfruit dessert, we chanced it and booked a special occasion dinner with a large group at Sage. Sadly, things were a bit hit and miss at the restaurant both in terms of service and food (on on that in a bit), but since we had an amazing spa filled afternoon, with plenty of pampering, getting acquainted with our girly girl, lots of great friends, lots of laughter made it a special girls night out. We asked the waitress how large the appetizers were so we could budget space for dessert, and were told most of the appetizers were quite small aside from the calamari which was a more shareable plate. Forewarned, we ordered of appetizers to start, with some of us ordering off the regular menu, and a few of us going with the set menu. Then we proceeded to wait and wait and wait. We were pretty hungry by the time appetizers came out and they disappeared in a flash so I didn't get a picture of everything. The first apply to arrive was from the set menu - Sage Salad with organic baby mixed greens, vinaigrette, blue cheese and walnuts. It wasn't out of this world with the run of the mill combination of ingredients, and we were surprised the kitchen didn't pay too much attention to plating, but hey, its salad and it was tasty none the less. Next up was the French Escargots cooked in fresh herbs and served with garlic toasts. Cooked just right and drowned in herbed butter, you really can't go wrong. For the price point, you could easily get same quality but double the escargots at other restaurants in Edmonton. We enjoyed the Crab Cakes made with jumbo lump crab meat and lobster reduction, though that disappeared so fast, didn't get a chance to take a picture before we demolished it. The next appetizer was Crispy Calamari, chipotle aioli which unfortunately was pronounced a complete disaster. The calamari was so overcooked, they resembled elastic bands more so than tender seafood, and the "crispy" batter fell off in unappetizing globs, which we had more fun pushing around the plate than actually consuming. Just avoid. the Tomato, basil and broccolini salad was a winner, with the fresh tomatoes pairing well with the creamy broccolini in a tasty dressing that tied everything together... thankfully salvaging a fellow foodie's meal as she went for a lighter meal - this salad along with the aforementioned calamari. No matter how you spin it, this "Seafood Feast" consistent of half a small lobster tail, one deshelled claw, four medium sized shrimp, one single medium seared scallop and 4 small wedges of fingerling potatoes. Should have asked how much of the lobster was part of the feast earlier (portion sizes not listed on menu) - however, the waitress had informed us it was huge and a lot of food. For $45, while well cooked, this was a paltry showing of seafood. I had a Filiet mingon with tart beet or berry reduction and avocado/basil infused oil with a few sprigs of grilled brocollini, carrot and steamed cauliflower. Unfortunately, despite me asking the waitress if she was sure mine was cooked to a blue rare - I was positive it wasn't with one poke from a clean knife... I ended up sending it back to the kitchen as it was cooked to a medium - as were all the steaks at the table (do I detect batch cooking? ), but thankfully my other girlfriends enjoyed their steaks more well cooked. I hate wasting food. Ate my sides while I waited for the steak to come out again. Pic of my girlfriend's medium well steak - done to her liking... lucky! Finally my steak came out by the time everyone had finished their food - and helped with my gigantic sides. I was surprised the filet wasn't wrapped in bacon or caul fat to keep it more moist, but it was well seasoned and while a smooch overcooked, I didn't care anymore, I was hungry!!! as it was getting close to 10pm... and we had entered restaurant around 8pm. It wasn't as silky smooth as I expected it to be - they need to age their meat more or start purchasing better grades of meat. 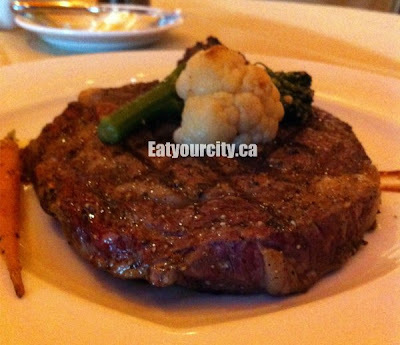 Than again, I love minimally aged 14days and sterling grade as a starting point for good steaks... Albertans know their steaks, it would be good if Sage learned to as well. The Ewe-Nique Farm Duo of Lamb Rack of lamb was thoroughly enjoyed. The rack of lamp was cooked to a nice medium rare, but the chunk of lamb it came with came out a wee too overcooked, taking away from the silky tenderness of the lamb. The seared salmon that came with the set meal was another winner - cooked a silky perfection just shy of cooked - warm plate finished cooking process, it was seasoned well and topped with a refreshing salsa of diced tomatoes and fresh herbs. Wild Mixed Mushrooms, the other the Sweet pea risotto. The wild mushrooms was a bust - they were all run of the mill store bought mushrooms! They were tasty cooked in basil and lots of wine, but I was expecting wild mushrooms! Grr. If the kitchen was out of wild mushrooms, let the customers know and I would have ordered something else. The sweet pea risotto was okay - creamy and not too gummy, it had a few peas sprinkled here and there, but sadly not made with the favoured Arborio rice most Italian chefs swear by- if they did, it would have been much more creamy and indulgent. Its amusing the sides individually were larger than my steak. The poppyseed cake was enjoyed more than the strongly flavoured ice wine sorbet that came as the set meal dessert. It took us a little bit to realize the frozen fruit that resembled dried out jubejubes was supposed to be fruit. one of the sorbet toppers jumped off its cake long before it got to to the table. One made it to my side of the table intact, but it was dug into before I had a chance to take a picture lol! The waitress warned me the strawberry shortcake creme brûlée was not a brûlée at all. Well, either name it properly on the menu, or just tell me the kitchen is out and they have something else to substitute. I ordered it anyways, and it turned out to be a deconstructed strawberry shortcake. A smooth strawberry and vanilla scented mousse it topped with a bit of strawberry sauce, a trace of whipped cream and a crisp dense poppyseed studded shortbread. Tasty. Too bad they didn't incorporate burnt sugar topping as a garnish - then it truly would have been a deconstructed strawberry shortcake creme brûlée. Overall, there were more misses than hits at Sage, with lacklustre service and poorly executed, uninspired food. They fell short of many aspects we consider standard at run of the mill restaurants and have a ways to go both in terms of service, food execution, and attention to detail detail detail. The final damage was about $100 a person multiplied by ~10 people (some went with 2 appys as dinner, while others had appy, entree, dessert and a drink), before taxes and before the 20% automatic gratuity tacked onto the bill.